If you or someone you care about suffers from diabetic pain, you know how debilitating the condition can be. 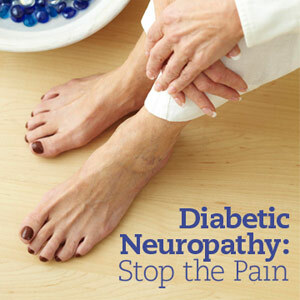 This pain is a result of nerve damage resulting from the diabetic condition. Over time uncontrolled sugar levels cause nerve damage, often in the toes, feet and hands. Nerve pain can be difficult to treat and is often resistant to drugs. That’s where Calmare Pain Therapy Treatment can help. This drug-free, pain-free therapy is now available at Rutherford Allied Medical Group in northern New Jersey, the one and only pain treatment facility in NJ authorized and trained to use the technology. We hope you will contact us just to learn more about the treatment and how we can help you say goodbye to pain as a result of diabetes.